The Costa Mesa Sanitary District announced today that Mike Scheafer was appointed as President of the Board of Directors at their meeting last night. Scheafer is a nearly life-long resident of Costa Mesa, successful businessman and community volunteer. According to the press release, he was first appointed to the CMSD Board in 1993, where he served for two years. He was elected to the Board again in 2010 and recently re-elected for another 4-year term. In addition to his service on the CMSD Board, Scheafer has been a member of the Costa Mesa-Newport Harbor Lions Club where he chaired the annual Fish Fry many times. He was on the Board of the Boys and Girls Club of the Harbor Area; Costa Mesa Senior Center; Costa Mesa United; South Coast Children's Society; Newport Elks Lodge and was Chairman of the Costa Mesa 60th Anniversary Committee. He is also President of the Independent Special Districts of Orange County Executive Committee and is a member of the Board of the Special District Risk Management Authority. 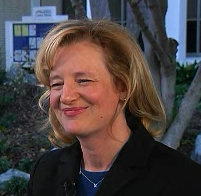 Scheafer has also served the community as a member of the City Council and the Parks and Recreation Commission. Also announced in the press release - Art Perry was appointed as Vice President; Bob Ooten was appointed as Secretary and Arlene Schafer as Assistant Secretary. 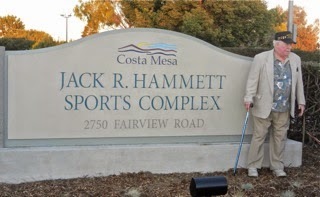 The services for former Costa Mesa Mayor Jack Hammett have been announced. Visitation tomorrow, Thursday, 5-8 p.m.
Mass, 11:00 a.m., Graveside Service, 1:00 p.m. and Celebration of Life, 2:30 on Friday, December 19, 2014. You can read the details from the City of Costa Mesa Press release HERE, and more information at the Dignity web site, HERE. 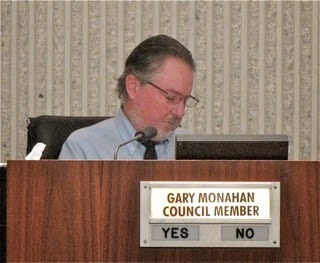 We also learned that Gary Monahan - who has begun his final two years on the council - can probably be a force to be reckoned with on this council given the right topic and the right circumstances. This afternoon meeting was one of those times. 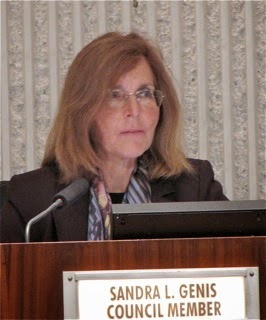 And, we learned that Sandra Genis continues to do her homework and ask tough questions and will not easily be dissuaded from getting answers. As the meeting began it looked like we might have trouble meeting a quorum. Both Righeimer and Monahan were tardy - Righeimer by a few minutes and Monahan was 40 minutes late. 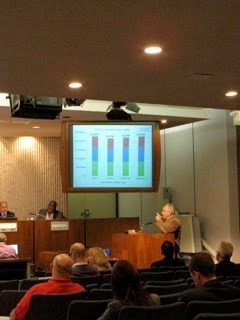 There were only four people who signed up to speak during Public Comments. Flo Martin asked for better fencing around the vernal pools at Fairview Park and spoke of clear footprints through them yesterday. Riganista sycophant Jim Fitzpatrick used his three minutes to plant a big smooch on the fannies of Righeimer and Mensinger as he spoke of the arrest of Private Investigators Chris Lanzillo and Scott Impola, and quoted from the transcript of the investigation. Beth Refakes wished all a happy holiday and reminded us of the Snoopy House event ongoing at City Hall from now until December 23rd each evening. Jeff Arthur, Chairman of the Pension Oversight Committee and a self-proclaimed PERS retiree, made a brief presentation using slides to demonstrate that our unfunded liability is getting worse, not better. For the first time in my memory none of the council members had comments to make. CEO Tom Hatch was also brief, announcing that services for former Mayor Jack Hammett were pending and that the Senior Center would have its grand re-opening this Friday, the 19th, at 10:00. As it turns out, that event will directly conflict with the services for Hammett, which begin at St. Joaquim Catholic Church on that date at 11:00 a.m. You can read about the all-day event HERE. We hoped the brevity was a sign of a short meeting. Nah, it was not to be. So, the five dozen people in the chambers settled in as the only item on the agenda - the future of Medical Marijuana in our community - was addressed. Deputy City Attorney Chris Neumeyer was the lead presenter and he went through the staff report, capsulizing each segment in a brief, efficient manner. The staff report can be read HERE to understand the issues involved. You'll note there are 33 attachments. Item 33 is a map of potential sites for Medical Marijuana facilities using a 500 foot radius. Foley had asked the staff earlier for the same map with 1,000 foot radii, which was presented later in the meeting. That's important, because it became foundational to her discussion later. Neumeyer explained that the task before the council today was to determine how to handle the two competing initiatives that have qualified to be placed on a ballot for a vote of the people. He also explained the conflicting laws in play because the two initiatives have a taxation element in them, which requires them to be placed on a ballot at which council members will be chosen. That means November, 2016. There is also a statute that requires initiatives to be placed before the voters promptly - in this case within a few months. And, adding to the joy of the afternoon was Gary Monahan's ordinance - rejected by the council earlier this year. They had some difficulty looking for a name for it and eventually called it the "city ordinance". Bradley Zint did a good job, HERE, in describing the meeting in the Daily Pilot. He gave you most of the facts, but not the fun. After the staff presentation a spirited half-hour discussion took place between the council members, sorting out definitions and staking out philosophical territory. At 3:20 the Public Comments began. Sixteen (16) people turned in cards. Seventeen actually spoke - a dozen in favor of Medical Marijuana and the remainder against. I won't try to give you every word of every speaker, but will capture some of the comments. 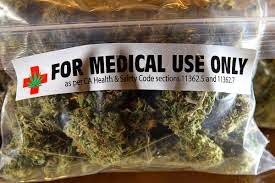 Flo Martin described herself as a 40-year marijuana user and, as a senior citizen, she uses it for pain now. Mesa, spoke with great articulation, suggesting a study group be formed to create a proper ordinance. Paul Lucas suggested contact with the Orange County Health Department, and said patients shouldn't be forced to go to industrial areas to get their medicine. Virginia Vargas, a young mother, spoke about the availability of drugs to kids and was concerned about dispensaries being sources for those drugs. Ann Parker suggested that kids will get the drugs regardless, and described anecdotal information about Newport Harbor High School students and drugs. 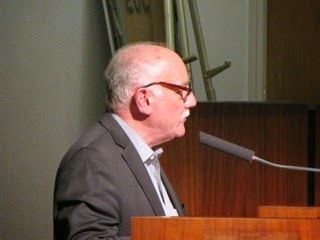 Randall Longwith, an author of one of the initiatives, expressed concern that it has gotten this far. He told the council he would have preferred for the city to create an ordinance, but when it didn't he moved forward with his. 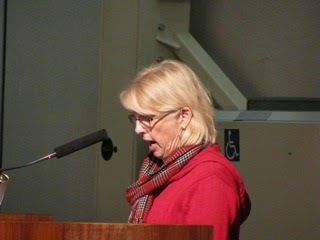 Gay Royer referred to the old movie, "Reefer Madness", was in support of Medical Marijuana and suggested that the dispensaries should be in safe places. Gary Parkin told us his father used Medical Marijuana and suggested we "go small" to start. Sue Lester, a former dispensary owner, stressed the importance of a proper ordinance, and indicated zone the hell out of it". She indicated that, since recreational Marijuana use is still against state law, any operator who is NOT licensed should be closed. She said, "You guys have to do something because it's being rammed down your throat." that Monahan's ordinance was a good start, but needed some fine-tuning - safeguards. She suggested a strong permitting process and "
Michael Alexander said his father was a police officer for 26 years and that we shouldn't worry about the money. has been part of the earlier discussion - was a horrendous undertaking. He wondered about California standards for cannabis. He suggested we "do the things we can actually do." A Newport Beach lawyer named Lance Rogers presented his personal history in Medical Marijuana in the state and suggested he might be helpful to the City. He said we have a "fantastic opportunity". Resident David Kincaid, a supporter of Medical Marijuana, wondered about nearby cities, and whether we would be "going it alone." 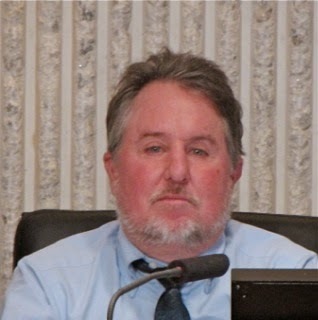 Robert Taft, Jr is a "main proponent" of one of the initiatives and referred to the Santa Ana ordinance, which had been presented for terms of comparison in the staff report. He expressed concern that, as a result of its new ordinance, Santa Ana's dispensaries will be moving into Costa Mesa without any controls. He said we don't want to see 100 rogue stores in Costa Mesa. 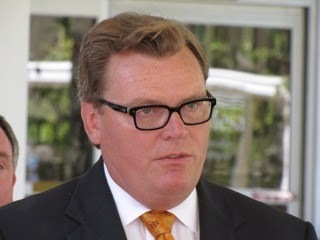 Undertaker Bruce Lamb described attending to those who died of overdoses and referred to marijuana as a threshold drug that could lead to harder drugs and overdoses. 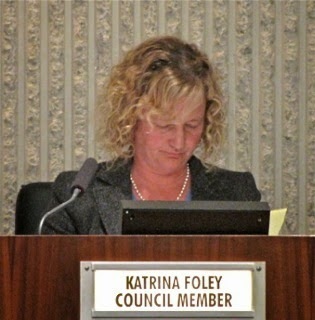 Former council member Wendy Leece referred to a recent New York law as something that should be part of any discussion of the issue in Costa Mesa. 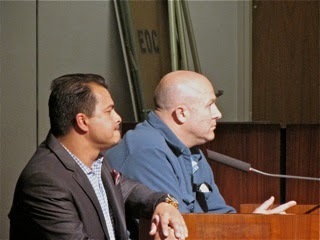 Travis Acevedo suggested that we get ahead of this issue, and also referred to the Santa Ana ordinance and the fact that rogue dispensaries will be coming to Costa Mesa. He said, "It's coming and you need to be ahead or behind it." Just after 4:00 the comments ended and Righeimer just shoved his way right into the discussion. He went off on a tirade, speaking of the fact that "anybody in this room could go get medical marijuana" without a prescription. He referred the anticipated influx of dispensaries to the Sooners of Oklahoma, waiting for the land rush. He suggested that, with the "Santa Ana experiment" going on next door we should give it a couple years to figure it out, and talked about the costs of litigation. Well, he should know - he's the reason for our litigation season. He suggested a study group of all stakeholders and mentioned being in Colorado recently and it's a mess. He then, without practically taking a breath or giving any other council a chance to even speak, made a motion to move the initiatives to the 2016 election and to form a task force to study it. He said he's not in favor of ANY of the initiatives. Genis seconded it for discussion. Then Foley took over. With Genis' permission, since she had the floor to discuss her second of the Righeimer motion, she launched into a carefully-crafted monologue about an alternative to that motion. She spoke of her concern about the children of the community and safety of customers. 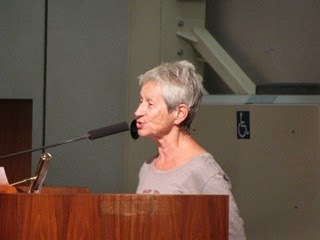 She shared about her family members who have used marijuana and how it was a gateway drug. She worried about the ancillary effect on neighborhoods, referring to liquor stores as an example. She mentioned Department of Justice guidelines for such establishments. She suggested we move forward slowly, then suggested adopting Monahan's ordinance, HERE, with some changes. 1 - Using the 1,000 foot buffer from all residential areas , R-1, R-2 and R-3, leaving it to industrial/manufacturing zones. 2 - Operators must obtain a permit. 3 - Minimum age of purchasers would be 21. 4 - Council could amend or repeal the ordinance. 5 - No felons with such records the past 10 years could operate or work in a dispensary. 6 - A Conditional Use Permit would be required. 7 - No product delivery within the first two years. 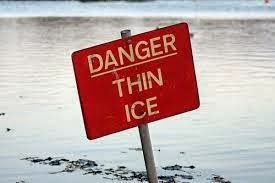 8 - An annual review and report required by code enforcement. Additionally, there would be placed on a special election ballot in March, 2015 a Special Tax proposal that, if approved by 2/3 of the voters, would assess a 10% tax on the gross receipts for such businesses, which would be earmarked for the following uses, in order. Foley stressed that if money ran out as it was distributed down the list, then those uses further down would receive no funds. 1 - reimbursement for the cost of the special election. 2 - code enforcement costs to manage dispensaries, ensuring compliance. Righeimer reacted by saying something like, "Oh, great, now the whole city will have to get stoned to pay pension liabilities!" Foley's retort was, "Well, at least I'm trying to do something about it. You're doing nothing!" As I said earlier, it was great theater. 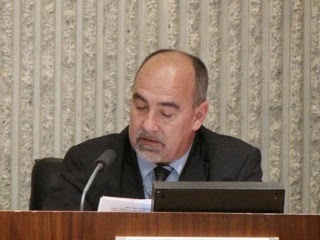 Amazingly, Monahan seconded the motion and suggested some modifications. He expressed concern about the 21 age limit, suggesting that younger users with prescriptions could be accommodated if accompanied by a parent. He also suggested a minor Conditional Use Permit, citing that these were just like any other business. Genis seemed supportive. Monahan expressed concern for the probability of yet another petition being circulated and being forced to place it on another ballot. 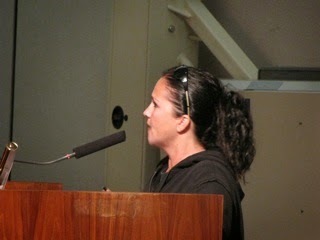 Foley invited the two petition authors up to speak... Righeimer balked, but was out-voted, 3-2, to let them speak again. I smiled. During that conversation they confirmed Monahan's concerns. Longwith said he was 100% behind what the city was trying to do. It was observed that the petition cannot be withdrawn now, but Foley indicated that the supporters could actively NOT support it at the 2016 election. In the end here's what happened. The council voted, 3-2 (Righeimer and Mensinger voting NO) to support Foley's idea to bring forward Monahan's ordinance with the modifications cited to a January Study Session, where the issues would be hammered out and finalized and presented to the council in a regular meeting in January - probably on the 20th. The council also voted, 4-1 (Righeimer voted NO) to place the two initiatives on the 2016 ballot. 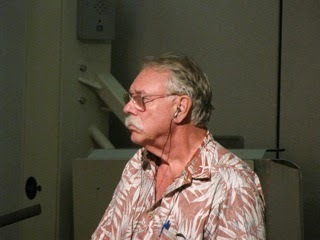 A couple observations... First, Steve Mensinger had a rough outing as the first-time operator of that meeting. It was much like Johnny Manziel last week when he started for the Browns for the first time and they were blown out by the Bengals. 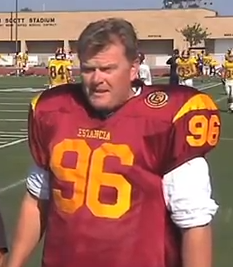 Sorry, but Steve is a football guy, right? He completely lost control of the meeting several times. He even broke out the gavel Righeimer gave him when he was anointed as Mayor to try to restore order. You can blame part of that on Righeimer's difficulty of letting go of the reins and also on Foley's strong position on the issue at hand. She was clearly the best prepared of the group... the word "leadership" comes to mind. Second, it's going to be a long, long couple years for Mensinger and Righeimer if this meeting was any indication. I smiled a lot. I don't know how successful Genis and Foley will be in trying to change the course in our city, but we know now that Monahan can, and sometimes will, listen to an argument, so there's hope. That's enough for now. 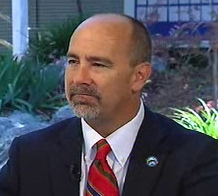 Recently, the Orange County District Attorney stated that the Costa Mesa Police Officers Assn. paid to have some of our elected officials surveiled in the months prior to the November 2012 election. We find this deeply concerning and will work vigorously to obtain and evaluate all information about the conduct of any involved Costa Mesa police officers, whether on or off duty, and to do so in a thorough and unbiased manner. 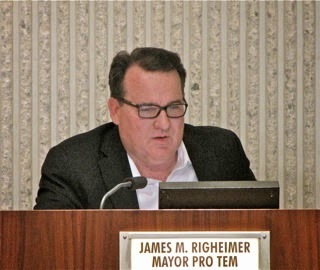 Close scrutiny is being given to whether, and in what manner, any member of the Costa Mesa Police Department had culpable knowledge of or aided in the surveillance of our elected officials, or engaged in any other violation of the rules, regulations and standards of conduct of the City and Police Department. 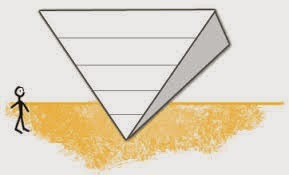 If warranted and in coordination with the District Attorney's Office to insure no impacts on its criminal investigation, an internal investigation will be initiated by the City and conducted by an independent party to provide all concerned with confidence in the completeness, fairness, and impartiality of that process. Strong and appropriate action will be taken if misconduct has occurred. We are sorry that Mayor Steve Mensinger, Mayor Pro Tem Jim Righeimer and Councilmember Gary Monahan and their families were put in this unacceptable situation. They are responding to a press release issued by Orange County District Attorney Tony Rackauckas last week, HERE, in which the arrest of two private investigators, Chris Lanzillo and Scott Impola, were arrested and charged with four felonies. Nowhere in that press release by the OC DA does it name ANY member of the Costa Mesa Police Department or the Costa Mesa Police Officers Association as being culpable of ANY crime, although it does refer to the law firm the CMPOA hired to do "candidate research". One could presume that if any member of the CMPD had been specifically implicated in the activities described in the OC DA press release they would also be charged with the crimes - but they were not. I know several members of the CMPOA spoke before the Grand Jury and that an affidavit exists which refers to activities from that Grand Jury, although I have not personally seen the document. ASSUMING GUILT, TAINTING A JURY? What is very distressing to me is the willingness of Hatch and Sharpnack to ignore due process and assume that members of the CMPD are guilty - even though nobody has been charged with anything. This stinks! And, I find it oddly curious that Mensinger, himself, was guilty of hiring a PI to surveil employees he thought might be stealing his campaign signs. That little activity cost Steven White his job with the city, despite the fact that he was acquitted of the alleged crime. Talk about a double standard! It seems to me that Hatch is skating on thin ice here. Police officers are guaranteed certain rights under California Government Code Section 3300 - 3313, commonly known as the Public Safety Officers Procedural Bill Of Rights, HERE. 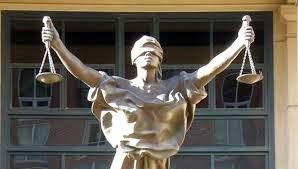 Section 3302 (a) states: Except as otherwise provided by law, or whenever on duty or in uniform, no public safety officer shall be prohibited from engaging, or be coerced or required to engage, in political activity." 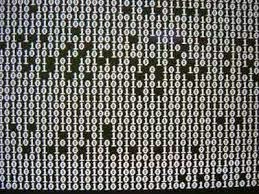 There's much more to that section of the code, which you can read at your leisure. And, I'm concerned about just who's going to be doing this "internal investigation" Hatch refers to. Will he contract with an outside police agency? The Orange County Sheriff's Department? Newport Beach Police Department? Or, will he have members of his 5th floor hierarchy take a stab at it. As one person commented in the thread on Bradley Zint and Jeremiah Dobruck's article on this issue, HERE, "It's a far cry from an alleged conspiracy to a conviction." She reminds us of the many questionable actions these guys have taken and didn't even mention the more than 200 bogus layoff notices that generated a lawsuit that is still percolating in the system. Then, during a pause, I found a Google alert that linked to Jordan Graham's piece in the Orange County Register, HERE, and my perspective changed dramatically. That article refers to an affidavit, and quotes liberally from it. Some of you may not be able to read the article because of the Register Pay wall, so I'll give you a taste of it. It speaks of coded messages between investigator Chris Lanzillo and Dieter Dammeier of the law firm Lackie, Dammeier, McGill and Ethir, which had hired Lanzillo to perform surveillance on Costa Mesa politicians. It documents the acquisition and placement of GPS tracking devices on two individuals, including now-mayor Steve Mensinger. It talks of digging up dirt on Mensinger, Mayor Pro Tem Jim Righeimer and Councilman Gary Monahan and quotes from the text of the report about the possible tactics to be used. It talks about raising dues for Costa Mesa Police Officers Association members to cover the costs of the investigations and contacts between CMPOA officers and the law firm on the issue. I was distressed, figuring Graham may have misinterpreted the information, so I obtained a copy of the report to which he referred and read every word of the 27 pages - twice. I am not a happy guy. As I reviewed the report I just shook my head as I read the details of the investigation - search warrants for cell phone records, bank accounts and interviews with the parties involved. I was stunned at the actions and words attributed to officers I've come to know, admire and trust. I find myself wanting more information - more background - that would temper the appearance of this situation. We don't have all the details yet, and I'm still willing to let this case run its course, but I now understand why he feels this way. Members of the CMPOA are not talking on this issue yet, so we'll just have to wait to see if they can offer any clarification that will mitigate this situation. And, as I pause one more time before finishing this entry, I reflect on the lives that have been ruined by actions this council majority have taken. I recall the shell-shocked look on the faces of more than 200 employees on St. Patrick's Day, 2011 when they received those bogus layoff notices - the day Huy Pham leaped to his death. I recall Steven White, who was accused of stealing campaign signs by Mensinger and a private investigator, arrested, charged with a crime, lost his job and then was acquitted. His life was dramatically changed by the same man being quoted above. And I think of the dozens of employees for whom city government had become such a toxic workplace that they just left, retiring earlier than anticipated or simply finding jobs elsewhere. This is not the Costa Mesa I once knew. This is not the town where I felt we were in good hands with the City Councils in charge in years past. Today it's a town torn by distrust and divisiveness, where elected leaders overstep their authority with impunity and stifle dissent at every turn. It's a town where employees cower at the thought of elected leaders prowling the halls at their workplace. It's a place now where employees actively seek other jobs instead of pulling together to keep the City on an even keel. It's a place where contractors manage operations rather than senior employees with broad institutional knowledge and a true vested interest in the success of the City. This is a City upside down where the only department with a growing head-count is the Executive Offices! This is a place where prison early releasees and homeless seek shelter, rehab homes proliferate, businesses are discouraged from reporting crimes or suffer fines if they do, and where our public safety organization is held in such disdain by elected leaders that they seem willing to place the entire city in jeopardy just to get back at the men and women who are hired to protect and serve us. This is a City where we hire spinmeisters to paint a happy face on municipal dung heaps. This is a place where we hire party planners to distract us from the important issues, then are aghast when events like the 60th anniversary celebration is beset with no-bid contracts, financial irregularities and other misdeeds that result in tens of thousands of dollars in cost overruns. This is a city where elected leaders refuse to hear the voice of the people who overwhelmingly rejected a Charter scheme, so brought it right back for another epic fail at the polls. It's a city where leaders bemoan unfunded pension liabilities, yet do NOTHING about it. It's a city where it feels like we are being sold to the highest bidding developers, who line the campaign coffers of certain politicians, who then change the codes to make it easier for them to build more dense housing. It's become a city where the elected leaders don't serve the residents - they serve outside interests.